Look no further than Bingham and Young Eyecare for comprehensive OCT eye exams. With branches in Retford, Gainsborough and Lincoln, we offer quality eyecare that is unmatched in the industry and carried out by a skilled team of professionals. 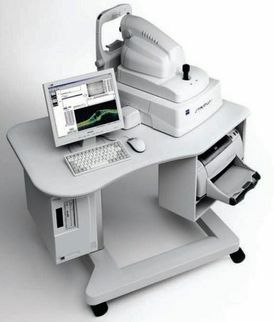 Optical coherence tomography (OCT) is a non-invasive imaging technique that uses light waves to take cross section pictures of your retina, which is the light-sensitive tissue that lines the back of the eye. This provides us with detailed images of the retina including the optic nerve, blood vessels, nerve fibre layout, and the macula. An OCT exam can alert us to unseen or unknown problems and can help with early detection, diagnosis, and treatment guidance for retinal diseases and conditions such as glaucoma, macular degeneration, and retinal tears. It is even able to help to diagnose signs of high blood pressure and diabetes. What Happens during the OCT Exam? The exam features a comfortable flash of light in each eye that takes a laser scan image like an X-ray. You will be seated in front of the OCT machine and rest your head on a support to keep it motionless. The equipment will then scan your eye without touching it. Scanning takes about two minutes, and then we can look at the scan immediately to discuss this with you as part of your eye test. Our opticians are also able to keep these images and check for changes in the future. As part of your eye test, we will also perform an OCT exam and include this in the £45 charge for private patients. If you are an NHS patient and would like to have an OCT exam along with your standard eye test, we are happy to do this for just £25. Contact us in Retford, Gainsborough or Lincoln, to learn more about our eyecare including OCT eye exams.